The Huskies moved the ball as well as they could have hoped, but the red zone was a problem. "We need to find ways to finish in the red zone," new offensive coordinator Bush Hamdan said. Bush Hamdan didn’t hesitate. If given one do-over from his debut as Washington’s offensive coordinator, what call would he change from the season-opening loss to Auburn? Six times the Huskies entered the Auburn red zone last Saturday. One touchdown, they scored. Twice during the third quarter the Huskies got inside the Auburn 10-yard line. Zero points, they scored. Those were the missed opportunities the Huskies are lamenting this week from the 21-16 loss in Atlanta. There were encouraging developments from the offense: Jake Browning had perhaps his best game on a big stage, the new-look offensive line held up better than expected, the wide receivers made big play after big play, and the Huskies moved the ball as well as they could have hoped — averaging 6.1 yards per play, compared to Auburn’s 5.2 yards per play. But the red zone was a problem. The Huskies had one third-quarter touchdown negated by an offensive penalty, and on the next drive Browning lost a fumble at the 3-yard line on the option play Hamdan referenced. Everyone took ownership of the Huskies’ red-zone blunder there: Browning said he should have held onto the ball; Hamdan said he should have called a more traditional run play; Chris Petersen said he should have had the offense better prepared for those situations. Before the snap that led to the fumble, Browning was surprised by the formation the Auburn defense showed. Before he could pitch to Salvon Ahmed on the option, Browning was hit by Auburn outside linebacker Nick Coe. The ball was knocked back to the 20-yard line, where Auburn recovered. Browning was sacked on back-to-back plays on his final snaps against Auburn, and after the last play he limped off the field and into the sideline medical tent. He then limped out of the UW locker room postgame with ice wrapped around his right knee. 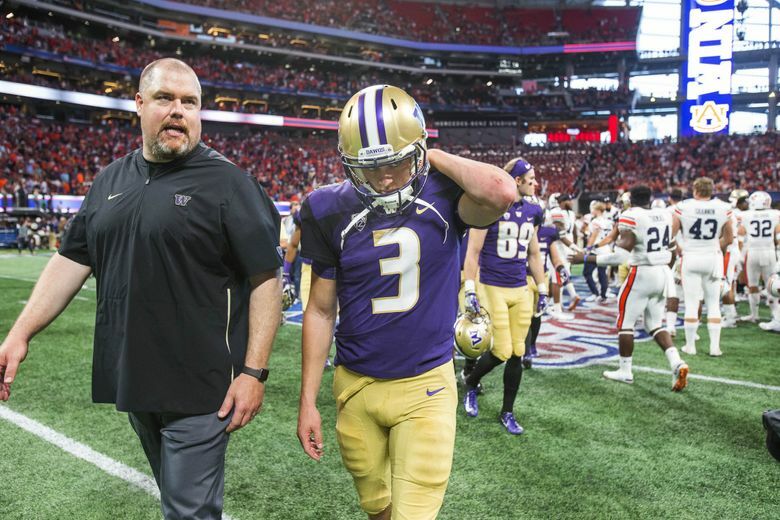 Asked about his knee Wednesday, Browning didn’t have much to offer, saying only it was “good — great.” UW’s team policy is to not talk about injuries.